There are probably numerous versions of Italian Style Rice and Beans recipes. This version is our original and produces a creamy dish reminiscent of risotto. The original version is lacto-ovo vegetarian but we turned it into a totally vegan dish pretty quickly with a few easy substitutions, which are mentioned at the end of the page. 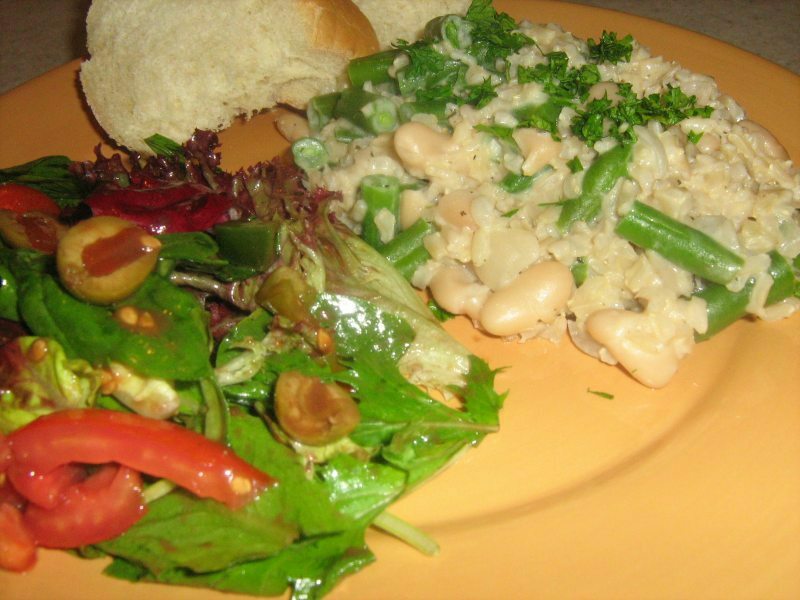 Italian Rice and Beans makes for a substantial meal entré, especially when paired with a nice Italian bread and a green salad. And it has a fair amount of protein, lots of fiber and little fat. Southern Rice and Beans and Spanish Rice and Beans! Stir in the green beans, Parmesan** and 1/4 cup of the half-and-half**. Cover again and cook for another 5 minutes or until green beans are tender. * When using regular rice versus the quick cook rice, we like to boil it for about 10 minutes before incorporating it into the recipe. This ensures that the rice will be fully cooked by the time the dish is complete.